The Carolina Thunderbirds are in town this weekend for a two-game set against the Mentor Ice Breakers. Friday’s game will feature a postgame skate with the players for all fans in attendance, sponsored by the Mentor Civic Ice Arena. 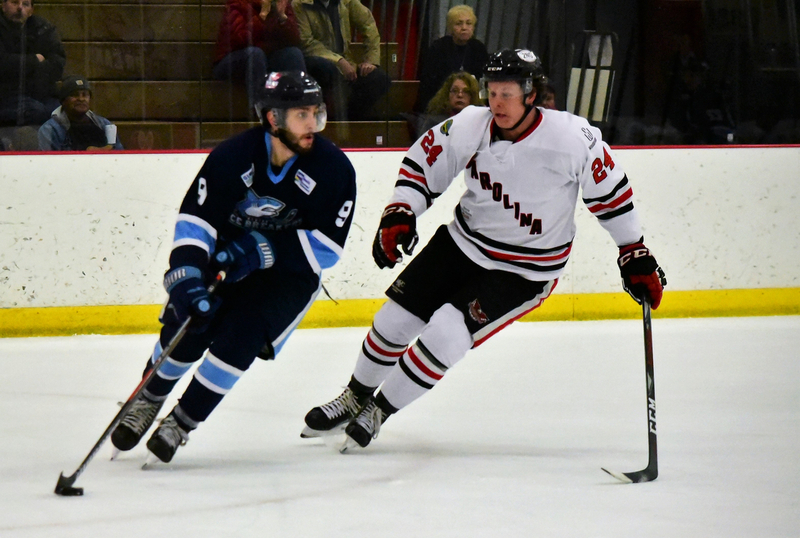 An up-and-down inaugural season continued last weekend for the Ice Breakers as they were blown out in a pair of road games against Port Huron while defeating the Prowlers in a wild 11-7 victory on home ice last Saturday night. Mentor is now tasked with two games against Carolina before beginning a stretch of nine consecutive games against Watertown and Danville. Several issues typically associated with young teams have plagued the Ice Breakers throughout the season. Mentor tends to give up quick goals early in games and often allows the opposition to score within a minute or two following an Ice Breakers goal. The Breakers are also a completely different team on home ice vs. the road. Mentor’s last road win came on November 24th in a 3-0 shutout win over Carolina that was the Thunderbirds’ final loss before their FHL-record 24-game winning streak. The Ice Breakers have been improving all around as the season progresses, but they still struggle to play full, 60-minute games. To its credit, Mentor has persevered despite facing adversity. The Ice Breakers have had some tough losing streaks, but they’ve also logged some notable wins, including a pair of regulation victories over the Thunderbirds earlier in the season. Mentor’s power-play unit stood out last weekend, converting five times over the three-game series against Port Huron. The Ice Breakers have the fourth-best power-play percentage in the FHL at 17.9 percent, but they lead the league in power-play goals with 38. Forward Gordy Bonnel (12-22-34) leads the team with five goals on the man advantage, while Mark Essery (15-16-31) and Patrick Porkka (10-9-19) have four apiece. Rounding things out are defensemen Thomas McKinnon (5-9-14) and Thomas Devesvre (3-11-14), who have netted three power-play goals each. Essery, who has dealt with an injury over the last month, scored a pair of goals in the 11-7 win over Port Huron last weekend. The Massachusetts native, who leads the Ice Breakers in goals, had not found the back of the net since mid-December. Blueliner Brody Duncan returned to Mentor’s lineup in a big way, scoring two goals and dishing out three assists over two appearances against the Prowlers. Duncan leads all Mentor defenseman with a 5-15-20 scoring line. Netminder Rick Odria made his Ice Breakers debut last weekend and logged his first FHL win after making 30 saves against Port Huron. Mentor currently has three goalies on its active roster as Odria joins Derek Moser (4.33/.881) and John Sellie-Hanson (4.38/.868). Forward Declan Conway is playing his best hockey of the season since returning from injury in late January. Conway has nine points (4-5-9) in eight games since coming back to the lineup and has provided the type of offensive boost the Ice Breakers anticipated when the Painesville, Ohio, native came to camp in early October. Mentor recently completed a trade with Carolina, acquiring forward Tommy Mahoney in exchange for future considerations. Mahoney’s 6-foot-4, 205-pound frame will give the Ice Breakers some valuable size, and his 6-12-18 scoring line over 29 games adds a nice scoring punch. Mentor will be the third FHL club for which Mahoney has played this season, as he also appeared in three games with Watertown and 26 with Carolina. The Thunderbirds’ FHL-record winning streak finally came to an end last weekend at the hands of Watertown, which logged a 3-2 win over Carolina and snapped its own 10-game losing skid behind a 45-save effort from Jared Rutledge. The Thunderbirds are no longer playing with the burden of the lengthy streak, but you can expect a strong effort from a Carolina squad that hasn’t been friendly with Mentor. The Thunderbirds and Ice Breakers are the top two teams in the FHL in penalty minutes, largely because of the all-out brawls that have occurred between the two teams on multiple occasions, including one game that drew 212 combined PIMs. Even though the two teams aren’t near each other in the league standings, it has become clear that Mentor and Carolina have developed a bit of a rivalry. Carolina is a club powered by depth scoring and overwhelming defense. Christian Pavlas (1.60/.938) and Henry Dill (1.99/.920) make up an unreal group of goaltenders that are far and away the best the FHL has to offer. Forwards Jan Salak (17-35-52) and Josh Pietrantonio (17-34-51) lead the way for the Thunderbirds’ FHL-best offense, while players like Jiri Pargac (18-27-45) and Chase Fallis (16-22-38) are dangerous whenever they hit the ice. Carolina has 10 players with at least 20 points and only three players who haven’t hit double-digit points. The T-Birds are as complete a team as you’ll find in the FHL, and the Ice Breakers know that firsthand as Carolina has beaten them seven out of nine time this season. To take down the Thunderbirds, Mentor needs to limit its mistakes and turnovers while taking advantage of any scoring opportunities it creates. Elmira had a nine-game winning streak snapped by Danville over the weekend as the two clubs split a two-game series at the David S. Palmer Arena in Illinois. The Enforcers fell by a 4-3 final on Friday night before responding the following evening with a 4-0 victory in one of their more complete efforts of the season. FHL all-time leading scorer Ahmed Mahfouz is having another strong year and seems to be good for multiple points almost every time he steps onto the ice. The Ottawa, Ontario, native is riding a 17-game point streak and has at least a point in 23 of his 25 appearances. The race for the league scoring title figures to be a three-way battle among Mahfouz, Port Huron’s Dalton Jay (30-33-63), and Watertown’s Tyler Gjurich (32-32-64), the FHL’s current leader in points. Carolina’s Salak and Port Huron’s Matt Robertson are both still in the mix with 52 points apiece, but for now both players are on the outside looking in. Next weekend, the Ice Breakers will take on Danville in a three-game series. After battling the Dashers at home on Friday, February 22, Mentor will travel to Danville to finish out the series with a pair of games on Saturday and Sunday. The Ice Breakers will follow that up with three games against Watertown March 1-3.